I did not have the pleasure of meeting or examining Mr. _______. My review was accomplished with the help of extensive written medical records you sent (thank you!) and a telephone conversation with the patient’s wife, Mrs. _______. The patient is undergoing excellent conventional and experimental therapy at (large well-known hospital). Therefore, as you directed, my discussion with Mrs. ________ centered on expanding integrative approaches to Mr. _______’s care, with the purpose of increasing the effectiveness of his conventional therapies. His supplement regimen is excellent. What stands out however, in recent blood tests, however, are elevated blood glucose and fasting blood insulin levels. These are far from the ideal levels of 83 mg/dl or below for glucose, and 5 mIU/L or below for fasting insulin. In fact, these abnormalities are possibly a major impediment to Mr. _______’s recovery. I say this because his PET scans reportedly document the glucose “avidity” of his tumor. Such a PET scan finding is proof that Mr. _______’s cancer prefers carbohydrates (glucose) for energy. Many cancer patients undergo PET scanning these days. Luckily Mr. _______ was one of these fortunate patients, because a PET scan provides incontrovertible evidence of the metabolic proclivities (glucose preference) of a particular patient’s cancer. Extensive animal research suggests that depriving a glucose-avid cancer of its preferred fuel, glucose, especially during radiation or chemotherapy, is often beneficial in potentiating the effects of the anticancer treatment. This effect is most powerful if calories are also restricted. One way to deprive a cancer of glucose is by abstaining from all calories. In other words, fasting, that is, taking only water. Another way is by means of the “ketogenic diet.” This is a high fat, low protein, very low carbohydrate diet. A common misconception is that the ketogenic diet requires large amounts of meat or other proteins. This is erroneous; excess protein intake will prevent ketogenesis. Another common misconception is that the ketogenic diet in a thin cancer patient will worsen weight loss. In fact, the ketogenic diet is one aspect of the treatment of cancer cachexia, the loss of lean tissue due to cancer-related inflammation. This because the ketogenic diet helps curb excessive inflammation, while a carbohydrate- and/or protein-heavy diet generally increases inflammation. Fat is the major component of the ketogenic diet. Protein is taken only in small amounts; carbohydrates are almost completely removed. The ketogenic diet is safe. But only if true ketosis is achieved and maintained, is Mr._________ likely to benefit. The goal of a ketogenic diet is to put the body into a state of ketosis, the use of fat as the fuel to sustain bodily functions. The amount of carbohydrate restriction needed to attain this state differs between individuals, and also varies in the same individual at different times. That is why no amount of carbohydrate counting can ensure that a person is in ketosis. Only when ketones are measured in the blood can one be assured that the goal, ketosis, is being reached. In my opinion, a home ketone meter is thus required for anyone attempting to use the ketogenic diet for medical purposes. The one I use most is the Precision Xtra blood ketone and glucose meter by Abbott. There are others. My own Precision Xtra, showing a nice ketone level! To enhance cancer treatment, the idea is to use the ketogenic diet to ensure the blood glucose levels remain low (50-70 mg/dl or 3-4 mmol/L) and the ketone levels high (3-4 mmol/L). The ratio of blood glucose to ketones is called the glucose/ketone index, GKI. Animal experiments suggest the GKI should be as close to 1.0 as possible for best effect during anticancer treatment. I have used it with selected patients during radiation and/or chemotherapy. Strict medical supervision is important. Urine strip monitoring of the state of ketosis is not adequate in my opinion during cancer therapy, as it does not allow quantification. “Purple” is not a number. The same reasoning follows for color-based ketone breath analyzers. 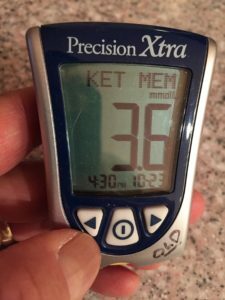 Finally, achieving ketosis by diet alone can take 3-5 days. This can be reduced to 24-48 hours by means of water fasting. I would suggest exploring a 24-48 hour water fast to achieve adequate blood ketone levels quickly, then maintaining the high ketone level with a ketogenic diet. The ketogenic diet is a medical procedure; I want to stress again that it should be done under medical supervision. That said, it is important to find a physician who is experienced and knowledgeable about the possible benefits to be obtained from the ketogenic diet. Physicians can retreat from recommending unfamiliar procedures, or ones that clash with older ways of thinking. 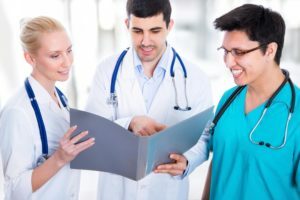 Not only must cancer patients find a supportive physician to monitor their explorations of the ketogenic diet, patients themselves must be extremely motivated to succeed with the ketogenic diet. They must read and educate themselves on the rationale of the diet in order to commit to it. They must also ensure that their living environment supports their efforts. One book that can help with motivation is “Cancer as a Metabolic Disease,” by Thomas Seyfried. This is a medical textbook, and therefore thick going for non-medical people; it records the work of Dr. Seyfried, a scientist who has spent decades documenting the effects of diet on cancer progression at his Boston College laboratory. 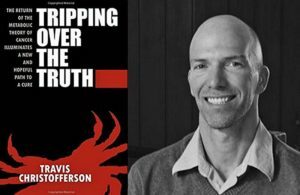 An accessible treatment of the same topic is “Tripping Over the Truth” by Travis Christofferson. This is by no means an “easy” book, however. Most find it extremely interesting, however. Patricia Daly is on the left, with coauthor Domini Kemp. 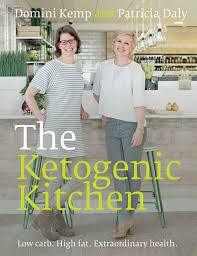 Patricia Daly and Miriam Kalamian have each written wonderful “how-to” books regarding the ketogenic diet. Books are not adequate, however, for proceeding with the ketogenic diet. 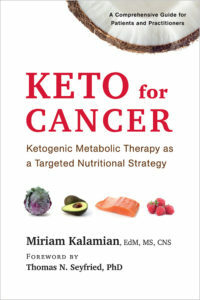 If Mr._________ is inclined to proceed, he and his wife will need coaching for at least a month.I suggest Miriam Kalamian or Patricia Daly; both are renowned keto coaches for cancer patients. They have large web presences and can be contacted that way. They are understandably not always available, as their services are in such great demand. However, they may be able to suggest coaches near Mr._________’s home. Online keto support groups are another source for coaches. Also, there are several wonderful family practice and internal medicine MDs in my medical community who are successfully guiding patients into ketosis during cancer treatment. If you or Mr._________ would like the name of those physicians let me know. 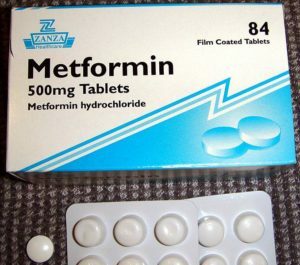 Metformin is being investigated as an adjunctive treatment for some cancer patients. Finally, consider metformin. A low dose would be a reasonable adjunctive medication in this case, even though the patient is not diabetic. If there are no contraindications in your opinion, Dr. ________, I would suggest starting with ___ milligrams twice daily with meals, and if this is well-tolerated, increasing the dose to ___ milligrams twice daily. The goal would be to achieve a consistent fasting morning blood glucose level at or below 83 mg/dl. I advised Mrs. __________ that as I have neither examined nor spoken to Mr. _______, he and I do not have a doctor-patient relationship. This means he must put into practice any of the above advice only with your supervision as one of his treating physicians. Because of your widely recognized expertise in integrative medicine, he is in good hands. Thank you again, Dr. _______, for allowing me to review Mr._________’s records, to discuss them with his wife, and to make some suggestions I hope you will find useful. Please call me with any questions, critiques, or ideas about this gentleman’s case.